These are in my top five favourite recipes on my entire blog. 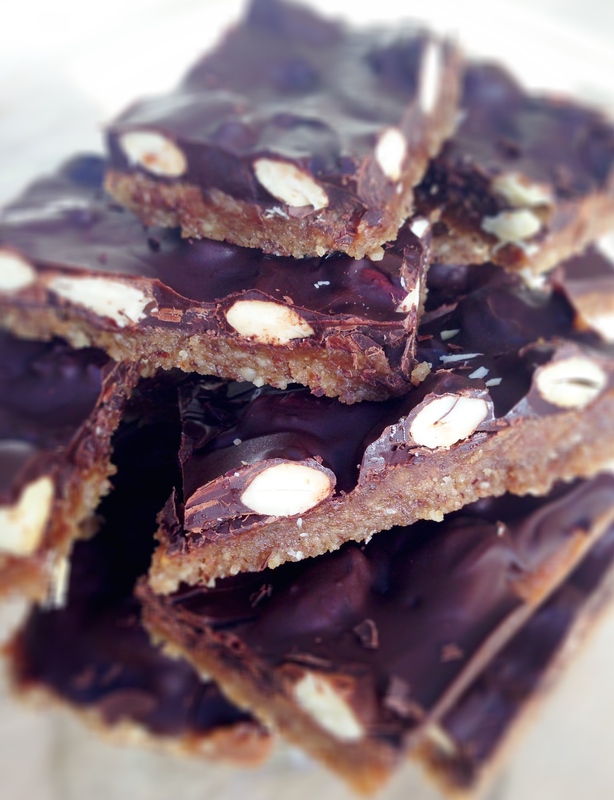 All my favourite things in one crunchy, chewy, sticky bar of deliciousness. As long as they’re in the house you’re lips will forever be lined with chocolate! To start, put the dates in two separate bowls, one for the base and one for the middle and pour boiling water over them, leave them to soak for about 10 minutes. Dry roast the nuts you are using for the base and the almonds for the middle layer (keep them separated so you don’t have to re-measure) at 180’C for about 8 mins (this adds an amazing flavour). Then add the base nuts to the food processor and blend until fine. Set the almonds aside. Pour the nut flour into a bowl and set aside. Add the base dates and two teaspoons of the water they were soaking in to the food processor and blend until you have a smooth paste. Then add the nut flourback in and blitz until you get a doughy mixture. You’ll have to scrape down the sides a couple of times to ensure it all mixes in evenly. Keep blending until it all comes together, it will happen suddenly! Spread out your mixture into a pan lined with parchment paper. For the caramel, drain the bowl of filling dates and add them to your food processor, blending until smooth. Then add in the coconut oil, almond butter and salt (don’t leave this out!). Blend it until you have a thick, smooth caramel. Spread this evenly over the crust. Sprinkle the roasted almonds over the caramel. Melt your chocolate gently on medium heat and then pour it over the almonds. 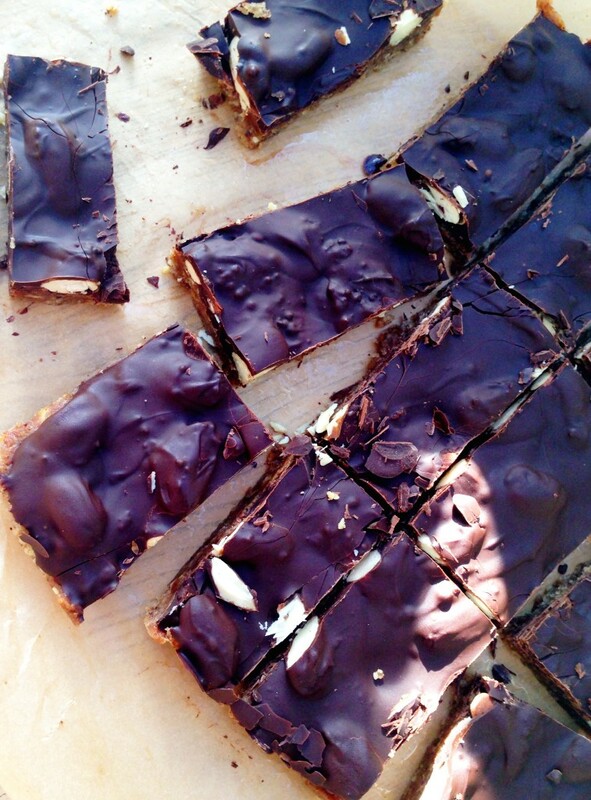 Pop the whole thing in the freezer for about 30 mins to set and then cut into bars and enjoy! Got all the ingredients. Gonna make these tomorrow! Thanks for the recipe. Amazing! Hope you like them!! What dark chocolate would you recommend? Thank you. I normally use Green & Blacks but it contains refined sugar so I’ll try Ombar! I’ve just made these, normally these type of things look better than they taste but they are lovely and the caramel layer has a lovely gooey texture like millionaires shortbread. Great recipe!